To ensure that water quality is protected and environmental health is maintained, it is important that the rules and regulations surrounding the use of septic tanks are adhered to. 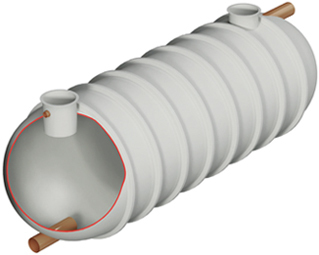 Since 2015, updated ‘general binding rules’ for septic tanks have been in effect – these regulate the usage of septic tanks and ensure they do not pose a pollution risk. Let’s take a look at what these rules cover, and when a permit would be necessary. First and foremost, your septic tank cannot be polluting or discharge into a watercourse or ditch. Once sewage has been treated and separated in the septic tank, the effluent should be sent to a purpose built drainage field where it can be dispersed and further treated by natural bacteria in the ground. If your septic tank currently discharges to surface water, you should rectify this as soon as possible – the cutoff date which this has to be done by is set for 1st January 2020. It is important that your septic tank meets the British Standards for such equipment and that you have planning permission and building regulation approval before installation. The current British Standard for septic tanks is the BS EN 12566 and your tank should have the CE mark on it somewhere and come with a certificate of compliance within its paperwork. When utilising a septic tank or small sewage treatment plant to handle wastewater, the sewage being treated must be from ‘domestic’ sources – for example, toilets and showers, or other such normal output from bathrooms or kitchens. What’s more, it’s vital your system is installed correctly and that you have the right sized system for your output volume. What’s more, under the new 2015 regulations, new discharges cannot be within 30m of a public sewer – in other words, when you can easily connect to the mains sewer, you should. If the development has several houses, this increases proportionally e.g. 4 new houses should be connected if they are within 120m of the mains sewer (4 x 30 = 120m). Your sewage treatment system needs to be well-maintained by a professional. Periodic servicing is a good way to achieve this, along with annual tank emptying which should be safely carried out from an authorised business. Your application goes to the Environment Agency and the cost will depend upon the amount of waste you plan to discharge. You can find further information on how to apply for a septic tank permit, or from contacting the Environment Agency. Wildon UK are experts in wastewater treatment and drainage, operating in Stoke on Trent and further afield across the UK. We have a wealth of experience and a highly trained, skilled team who can carry out installations, maintenance and repairs on a wide variety of systems. Don’t hesitate to contact our helpful team today for further information.